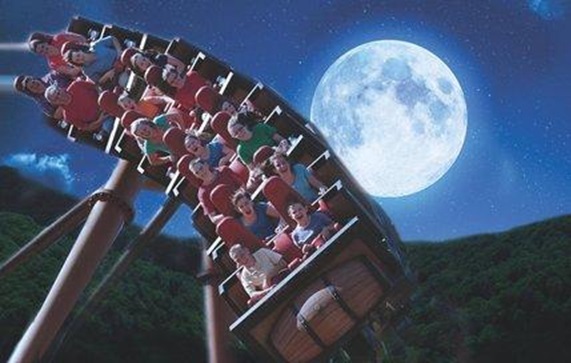 During the Moonlight Madness at Silver Dollar City in Branson, you can play all day and into the night with extended hours to ride on over 30 rides and play and dance under the stars. So put on your dancing shoes and join the fun on the City’s Square each night for a Street Dance featuring some of your favorites including the Chicken Dance, Electric Slide, and the Cotton-Eyed Joe. You will also get to enjoy special shows and sweet deals which make the Moonlight Madness a one-of-a-kind summer experience. Silver Dollar City will stay open until 10 pm each night from July 23 through August 7. Silver Dollar City is brimming with a variety of thrilling rides, live entertainment, and fascinating craftsmen creating everything from glass to leather goods and to baked goods. This award-winning theme park also boasts an array of dining options that include old-fashioned skillet cookery, smoked meats, funnel cakes, sweet treats and so much more. At Silver Dollar City, you will discover hand-crafted items that are skillfully created by the park’s artisans including jewelry, watercolor art, home furnishings and more. At Silver Dollar City, there are thrilling rides that you can enjoy under the starlight such as PowderKeg, WildFire, and Thunderation. During Moonlight Madness, you can come after 5 pm for just $25. The newest attraction that you can enjoy this year is Science Madness with David Willey. In this exciting attraction, you will see explosions, fire, and wild experiments that include demonstrations that have been featured on the Tonight Show with Jay Leno. Also featured in Red Gold Heritage Hall is a Stunt Dog experience with Chris Perondi. From Thursdays through Saturdays, kids can meet cartoon characters during Moonlight Madness which include SpongeBob & Patrick, The Backyardigans, and Tom & Jerry. The up-and-coming Northwest Arkansas country trio Edens Edge will perform for one night only on July 25 for a special concert with emcee Storme Warren of Great American Country’s entertainment news show, Headline Country. The park’s country music show, GAC Nights in Echo Hollow is free to Silver Dollar City guests which opens at 7 pm on Tuesdays through Sundays. Topping off all the fun at Silver Dollar City is the Street Dance that begins at 9 pm each evening during Moonlight Madness. In this exciting activity, you can join hundreds of guests on the square for fun dances such as The Chicken Dance, The Electric Slide, and The Macarena. Specialty shops and eateries will remain open until 10 pm where you can get the chance to buy merchandise specials and delicious food. As Branson boasts world-class live entertainment shows, you’ll also get to discover Branson entertainers at Silver Dollar City with their amazing singing, dancing, picken’, and playin’ all around the park, including the Cajun Connection, Sons of the Silver Dollar, and other sensational shows. So, if you want to enjoy a late night fun with street dances, fireworks, and thrilling rides, visit Silver Dollar City’s Moonlight Madness in Branson.